To support the desire of our donors to be educated philanthropists, the Funder’s Focus program shines light on organizations within particular programmatic areas that have our seal of approval. It is not our intention to fundraise for any particular organization, but rather to provide background information. You may find that these organizations coincide with your philanthropic interests and it would be terrific if you are moved to support one or more of them. If you find yourself choosing to support other programs, we celebrate that as well. Each year, our Community Grants Program committee Vice-Chair of Israel & Global Jewry reaches out to our friends and colleagues in Israel to ask about what we can do to have the biggest impact in the region. For many years, one of the top priorities has been, not surprisingly, promoting a shared society. After a great deal of research and outreach, we selected Israeli nonprofits that bring together Israelis and Israeli Arabs/Palestinians for organized joint activities in which participants go beyond dialogue to work together toward common goals. Below are the programs we want to share with you. Hand in Hand’s Tel Aviv-Jaffa School opened in September 2013 with the help of parents and community leaders who worked intensively with HIH’s staff to attain recognition and support from the Tel Aviv-Jaffa Municipality for a bilingual integrated school. The preschool opened with a class of 35 Jewish and Arab children and full municipal support. In the 2015-16 school year, the school has grown to 168 Jewish and Arab children: 121 preschool children in four classes, as well as two first grade sections, with 47 children. Based on registration so far, they expect the school to continue to grow in 2016-17 to include a second grade. The proposal submitted by Hand in Hand is for support of the school’s growth and expansion. Funds will be used to support the co-teaching model, provide a supplementary multicultural curriculum, teacher training and community building activities with Jewish and Arab adults. This is a project jointly proposed by the Arabs and Jews living along the seam of the neighborhood of Abu Tor in Jerusalem. Neighbors have collaborated to identify common needs and achieve concrete objectives for the short-term and long-term benefit of everyone affected. The grant proposal submitted to us by the Community Council requests support for joint activities that include: Hebrew/Arabic language classes, joint youth soccer, a joint community organic garden, a street fair scheduled for Sept. 20th featuring music and crafts of both cultures, a community art/coexistence graffiti project, an economic development initiative to create a data base of services that residents offer to increase opportunities for income generation, and an early childhood family task force that organizes events for Arab and Jewish families with children. The project leadership has offered to provide a neighborhood tour to members of the Tucson community or their friends traveling in Jerusalem so that they can meet with Jews and Arabs who are creating an inclusive community. Neve Shalom, also known as Wāħat al-Salām, is a cooperative village jointly founded by Israeli Jews and Palestinian-Israeli Arabs in an attempt to show that the two peoples can live side by side in trust, understanding, and mutual respect. 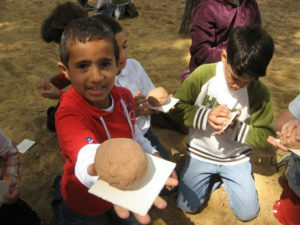 Neve Shalom/Wahat al-Salam Primary School is a bilingual, binational, multicultural Primary School that is “a living laboratory,” developing strategies for peace-building and conflict transformation, and serving as the laboratory school for World Peace College graduate students. The original grant submitted by the school requested funds to support their Jewish and Arab K-6 teachers, and to provide learning materials and equipment for students’ joint activities. Funding received as a result of this Funders Focus will help fund a new class of 24 students. Hagar is located in Be’er-Sheva in the Negev, a region that is home to more than 600,000 people, about 30 percent of whom are Arab citizens of Israel, mostly Bedouins. Hagar is the only school in this entire region that offers bilingual education in Arabic and Hebrew for a student body that is 50 percent Arab and 50 percent Jewish. In addition, Hagar’s 240 students — from daycare through sixth grade — participate in a curriculum that builds relationships and promotes understanding between its Arab and Jewish children. Hagar’s focus is on providing equal opportunity for its Jewish and Arab students and promoting the values of a shared society in the Negev. It is a public school recognized and supported by the Ministry of Education. The proposal submitted by Hagar is for a project that embodies its unique curriculum. The sixth grade class will deconstruct the narratives that perpetuate tension between Jews and Arabs in Israel and seek to understand how to transcend this conflict. With the help of a professional producer and instructor, each student in the class (with guidance from their Jewish and Arab co-teachers) will document their own learning process through film, as well as stories from their families and communities. After its completion, the film will be shown in public forums throughout Be’er-Sheva and the Negev. Let us know if we can help you learn more! If you have questions or require additional information, please click here to email our Grants Officer or call (520) 577-0388.